Professor Dr Grafton Everest’s latest outrageous entertainment takes us to London and New York after a series of hilarious meanderings in the land of Oz. 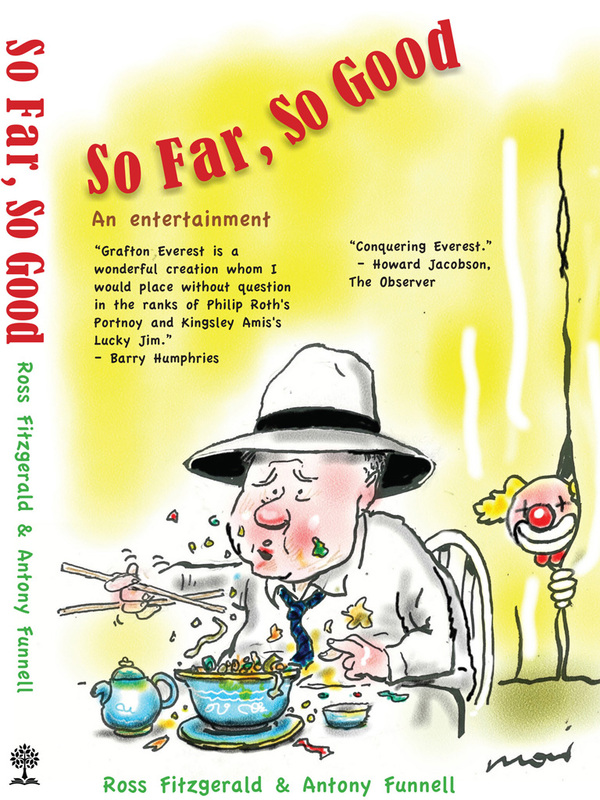 So Far, So Good centres on our hapless professor’s obsession with food and fame; his relationship with his increasingly independent wife Janet; their wayward (and soon to be married) daughter Lee-Anne; and his much-loved terrier Maddie. This cleverly plotted satire exposes the sad state of universities and of what now passes for politics in the West. Our obsession with technology, our fear of outsiders and our distrust of elites also come in for a pasting. Caught in a series of concentric conspiracies, Grafton manages to save the day, save the world and even launch Australia on the road to a republic. Well-known author and commentator, Professor Ross Fitzgerald, and Antony Funnell, of ABC Radio National’s “Future Tense” fame, have produced the funniest Grafton Everest novel yet. The previous Grafton adventure, Going Out Backwards, was shortlisted for the 2017 Russell Prize for Humour Writing. Ross Fitzgerald AM is the author of 40 books, including a memoir My Name Is Ross: An Alcoholic’s Journey; and the sexual/political satire Going Out Backwards: A Grafton Everest Adventure, which was shortlisted for the 2017 Russell Prize for Humour Writing. Antony Funnell is a Walkley Award-winning journalist, broadcaster, and author. He presents the weekly podcast/radio program “Future Tense” on ABC Radio National. Over the past few decades, he has worked for many of Australia’s leading news and current affairs programs, including “AM”, “7.30 Report”, and “Background Briefing”. Antony is the author of the non-fiction work The Future and Related Nonsense. Hybrid Publishing: Melbourne, 2018, $22.95.